The first-ever VdeV UK event took place at Brands Hatch today, with Adrian Mardlin and Rob Croydon in a Juno SSE becoming the historic first winners after a 105-minute race. Experienced racer Nigel Greensall, twice EUROBOSS F1 champion, had looked likely to win as he built up a two-lap advantage but, with just 20 minutes to go, he retired with mechanical problems. That handed the lead to Mardlin and Croydon, who duly went on to record the first ever victory in this brand-new series. 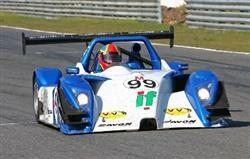 The Ligier JS49 of Neil Burroughs/Heath Marah came second with Tony Freeman/Duncan Williams third in another Juno. Chiron World Sports Cars also chose Brands Hatch today to launch their new Honda-powered CN Sports Prototype. Designed to run in the UK series, the Chiron will be the first Bio-Ethanol VdeV car and will makes its circuit debut in October. VdeV UK is the second new series this season to be launched in conjunction with MotorSport Vision Racing (MSVR), the first being the Lotus on Track Elise Trophy. Several of the Elise Trophy regulars took part in an entertaining pair of Open Sports and Saloon races, as Nigel Bent’s Caterham took overall wins in both contests. In the other race of the day, Peter Harper clinched victory by just under a second from Mark Charteris in the Classic Clubmans Championship.